The voice on the phone said that I would be photographing Blake Shelton, Country music star and judge on the TV show “The Voice” in an clothing commercial. 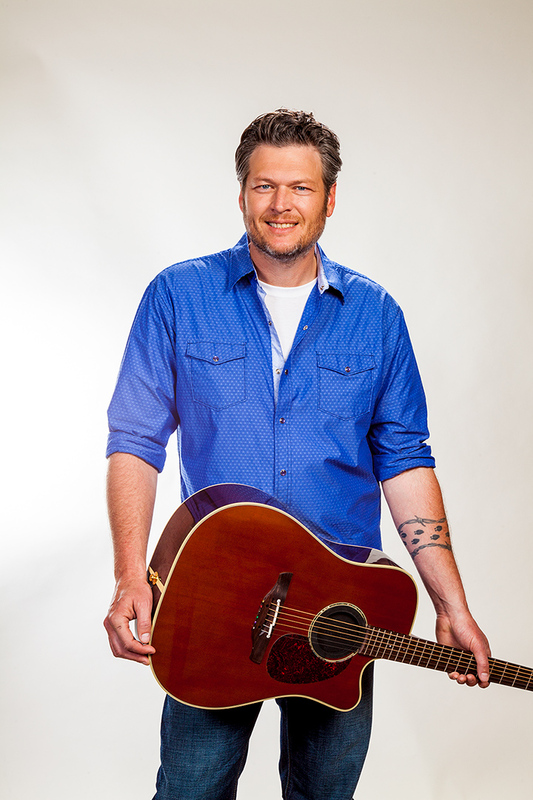 I was asked to photograph Blake Shelton during the production of a television commercial for Gildan underwear and socks. The set was a real dry cleaner shop in the downtown area of a suburb in Los Angeles. You can see the commercial at https://www.youtube.com/watch?v=AxILq2MxLZQ. I have shot production stills on the set of a number of television commercials, including a two day shoot for Nescafe Dolce Gusto coffee makers with Mario Lopez, see http://www.ispot.tv/ad/72ak/nescafe-dolce-gusto-featuring-mario-lopez. I find being on a commercial production set exciting, with lots of people working hard together to make the commercial top notch. The teamwork is awesome! 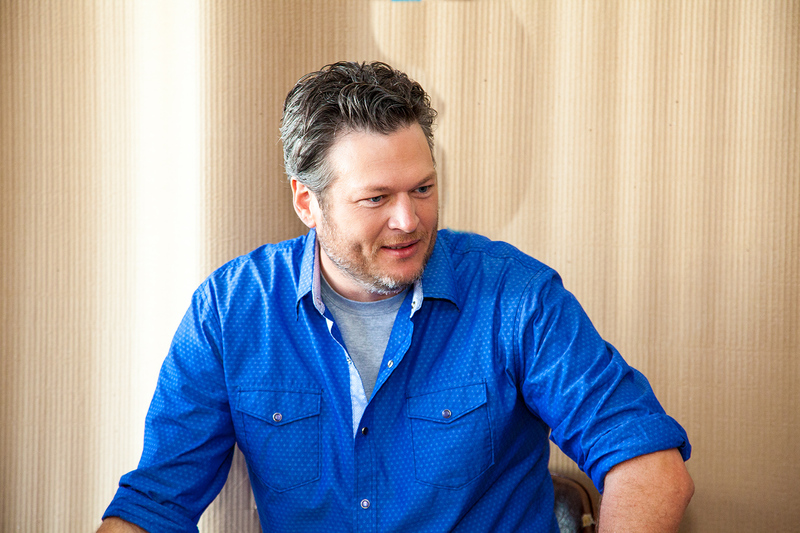 I photographed Blake Shelton in the dry cleaner shop full of video lights, crew and actors. Then on the sidewalk outside getting his makeup touched up, and in an empty shop next door in front of a white background. The shots done on the white background were the only ones where Mr. Shelton was being directed by me, the rest of the images were done with a number of broadcast quality video cameras pointed at him, directors and assistants. I asked Blake to hold his guitar as if he were playing it and to his side, then to sit in a chair and put his feet up on a table so that we could see the Gildan label on the bottom of his socks. He also did poses holding a package of Gildan underwear and with “his” underwear on a hanger in a dry cleaner’s clear plastic bag. I used a four head Profoto D4 lighting system, and put two lights pointed towards the white background, and two lights in medium softboxes pointed at Blake. The light bounced off the white background and reflected on his hair and shoulders, creating a “rim light” effect. Imagine my surprise when I walked into a Wal-Mart two months later, and saw my life size image of Blake Shelton holding a package of Gildan underwear on a point of purchase underwear display. I was proud as could be! The 60 megabyte file from my Canon 5 D Mark II held up very well at life size enlargement, I could not see any grain or pixels upon close inspection. Mr. Shelton was a complete professional; he had his smile down pat. He was personable, friendly, and yet stayed focused on his work. What a great subject to be able to shoot! The production company provided a stand in, wearing the same colors and about the same size as Blake, so I had the lighting well adjusted when he said down. There were clients and art directors watching on a monitor in the next room, so I had to get it right quickly. The country singer looked so natural in front of the camera, laid back in the chair, with his guitar in hand and his socks displaying the Gildan brand. I think he is a good choice for the spokesperson for the company; he portrays a very confidant and masculine figure in front of the camera.